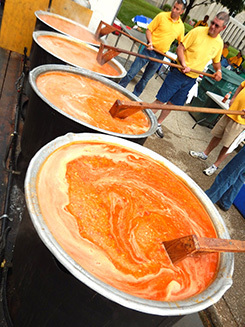 Swirling pots of burgoo are a photographic attraction at the International Bar-B-Q Festival; image by Tom Adkinson. 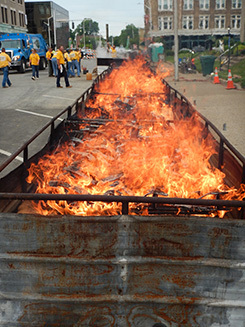 OWENSBORO, KY – There’s an eerie glow in the downtown streets of Owensboro when teams fire up gigantic fire pits in the early morning hours of the International Bar-B-Q Festival, a mid-May tradition since 1979. Each fire pit for the International Bar-B-Q Festival stretches almost the length of a downtown block; image by Tom Adkinson. An uninformed visitor easily could assume fire engines from four counties were on the way to put out a conflagration. Festival veterans, however, know that the soaring flames soon will die down to coals so each cook team can prepare at least 600 pounds of mutton, 400 pounds of pork, 300 whole chickens and 60 gallons of burgoo – a hearty stew of mutton, chicken and vegetables that originated in pioneer days. Their quest is the Governor’s Cup and bragging rights for a whole year in this corner of Kentucky that is crazy over barbecue. Mutton, sometimes jokingly called mature lamb, is a favorite in western Kentucky; image by Tom Adkinson. When you talk about barbecue in the Southeast, most people think only of pork. Not so for folks in Owensboro and elsewhere in western Kentucky. As the festival proves, you’ll find pork and chicken, but the regional specialty is mutton – which some jokingly refer to it as mature lamb. 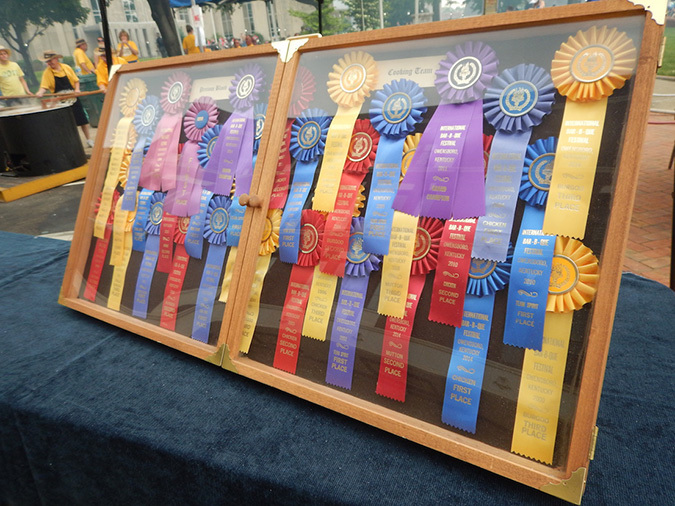 Competition teams must prepare 300 whole chickens, 600 pounds of mutton, 400 pounds of pork and 60 gallons of burgoo; image by Tom Adkinson. The seriously competitive teams, which have up to 40 cooks apiece, are the big show, but there’s a second competition category called the Backyard Cook-Off. 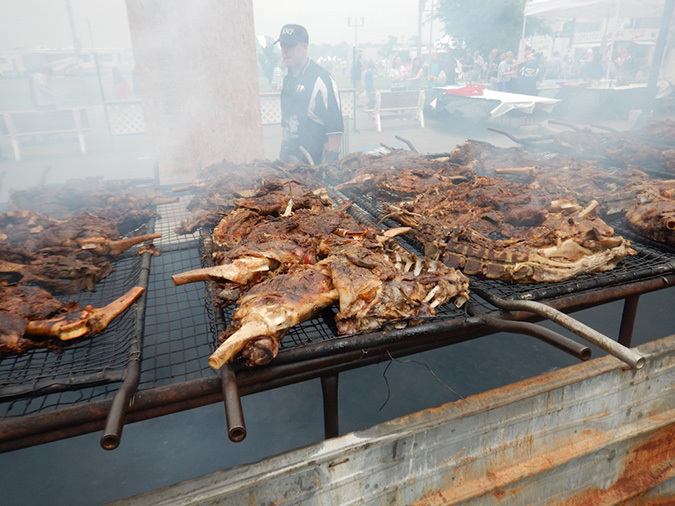 For this event, several dozen local grill masters and traveling barbecue teams set up smaller cooking operations and offer samples to festival goers. The festival’s competition teams are chasing ribbons and a year’s worth of bragging rights in a barbecue-crazy region; image by Tom Adkinson. Festival goers who want barbecue or burgoo in quantity can purchase them from the Governor’s Cup competitors after the judging is complete. 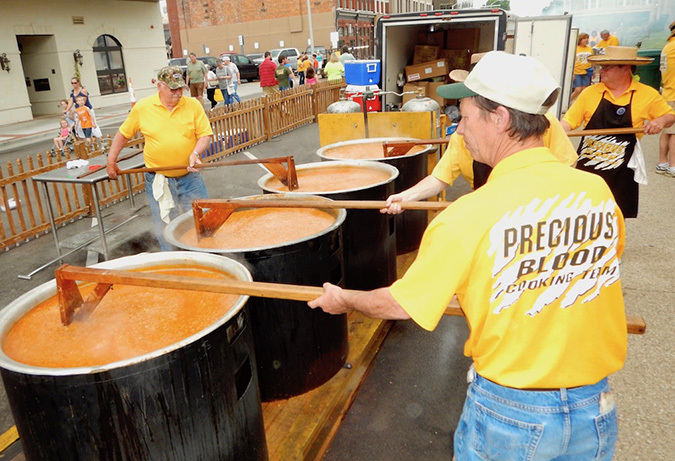 All through the day, the aroma of smoking meat fills this Ohio River town, and everyone marvels at the towering kettles of burgoo that must be stirred constantly with big wooden paddles. When all the excitement of the annual festival subsides, there still are ways to enjoy Owensboro barbecue and burgoo. The truly down-home way is to visit a church parish barbecue picnic. From May into September, there’s hardly a weekend without a parish picnic and the opportunity to truly eat local. They are a real tradition, dating at least to 1877. 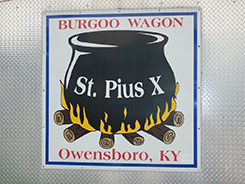 Owensboro restaurants, of course, serve barbecue and burgoo every day. The two most famous are the Moonlite Bar-B-Q Inn and the Old Hickory Restaurant. Both have been on Southern Living’s list of the region’s top barbecue restaurants. 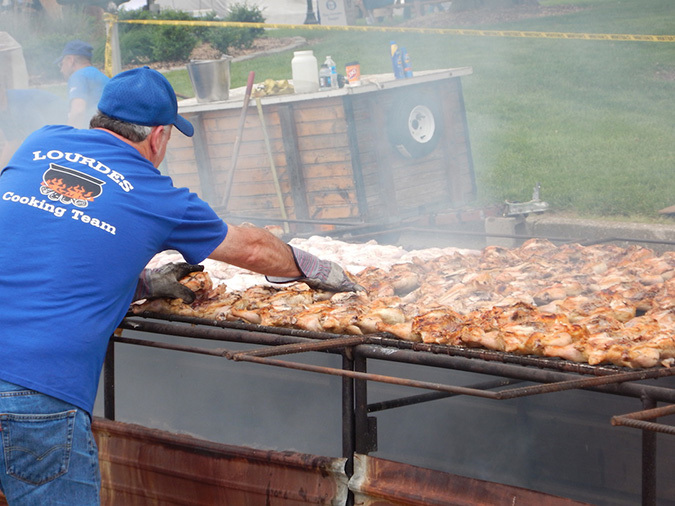 The 2019 International Bar-B-Q Festival is May 10 and 11, and the Owensboro Convention and Visitors Bureau keeps a calendar of parish picnics for those lower-key barbecue experiences. Owensboro, Kentucky’s fourth largest city, is an hour west of Bowling Green and about two hours southwest of Louisville.